For the last of this years books and booze posts I've chosen a collection of George Mackay Brown stories - 'Winter Tales' was the obvious one to go for, but 'A Time To Keep' and 'A Calendar Of Love' are two other particular favourites, and as the same themes run through all of his collections, all are an equally good place to start. 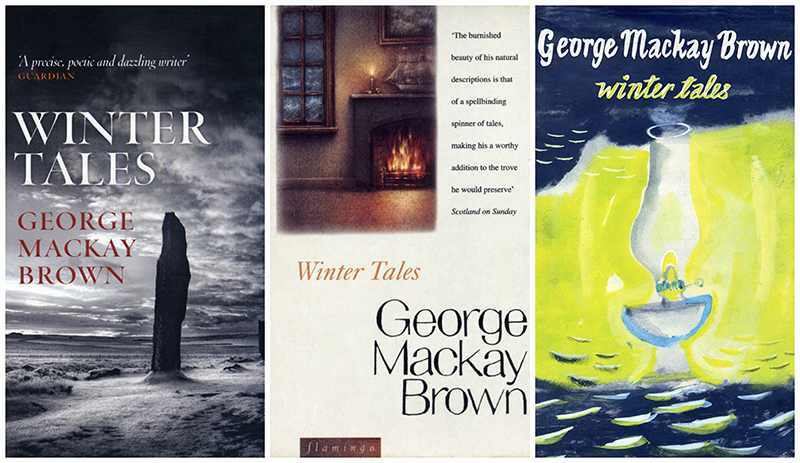 George Mackay Brown is an interesting figure, based in Orkney for the majority of his life, his work is deeply rooted in the culture and history of the islands, and also in his catholic faith. I've found the full length novels heavy going, and have no strong feelings about his poetry either way, but his short stories shine for me (I've deleted a whole lot of exubarent metaphors from this space). They deliberately look back to record an Orkney before oil money and technology radically accelerated changes in people's way of life and expectations. Here are the islands of his childhood, of his parents childhoods, and of millennia before that. He records the rhythms of the farming year, and an existence defined by the weather, the sea, and the hours of daylight. The stories don't just feel written, they feel told - some of them could be often repeated gossip, local legends, and just generally part of the fabric of island life. Part of why I ldon't be themnis because I do find them them comfortingly familiar and nostalgic, but there's more to them than that suggests - they're worth a look. Highland Park whisky is another Orkney icon, and probably far more famous than George Mackay Brown. It's not the only working whisky distillery in Orkney - there's also Scapa, which mostly goes into blends, but they do some distillery bottlings (which are probably worth collecting, anyone who has done do over the last twenty years would have an interesting liquid history of a distilleries mixed fortunes). It's the 12 year old that's the gold standard though, a whisky to measure others against, and undoubtedly a great all rounder. There's a touch of smoke and peat, but not enough to make it the defining characteristic, rich sherry fruit, and honey heather sweenes. 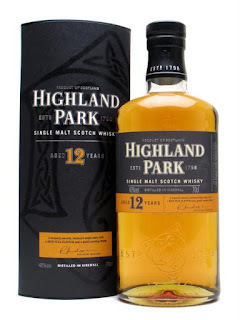 Identify the elements of Highland Park you like the best and use it as a signpost to discover other malts. Or just enjoy it for the excellent dram that it is. For such a small place, Orkney has produced some remarkable things. I've really enjoyed reading all your posts about the various drinks & their pairings with books. The trouble is now I have a long TBT (To Be Tasted) list as well as a TBR (To Be Read) list!! I remember belonging to a wine club around the time New World Wines were becoming available & still use the techniques learned to taste & appreciate, rather than just drink, these wines & spirits. Tasting is definitely different to drinking and it's a good skill/habit to have. I'm glad you've enjoyed these posts, I really enjoy writing them and am ever hopeful that I'm successfully sharing my enthusiasm for excellent wines and spirits (in a responsible way). There are so many exciting things out there just waiting to be tried. I have been watching an old episode of Dr Findlay's Casebook, starring Bill Simpson, Barbara Mullen and Andrew Cruikshank. Available on a BBC DVD as well as on YouTube. Surely that is among the nicest phrases in the language just so long as one isn't driving? If only the 25 year old Highland Park was on offer. At £300 a pop it is for Lotto millionaires. Dr Findlay may be kailyard (though witty kailyard) but George Mackay Brown is not. Let's drink to the memory of his genius and to all the Orcadians whom he celebrated in his work. Including the good Saint Magnus. Damn few and they're aa deid. Wishing you the peace of God that passes all understanding. Merry Xmas and a safe and happy 2017. Thank you! Yes, the 25 year old is sadly the preserve of the wealthy, I'm lucky to have tried it a couple of times at trade tastings. But perhaps I wouldn't have appreciated it as much if I could have taken drinking it for granted. GMB was an extraordinary writer, and one who's reputation seems to be growing which is encouraging.